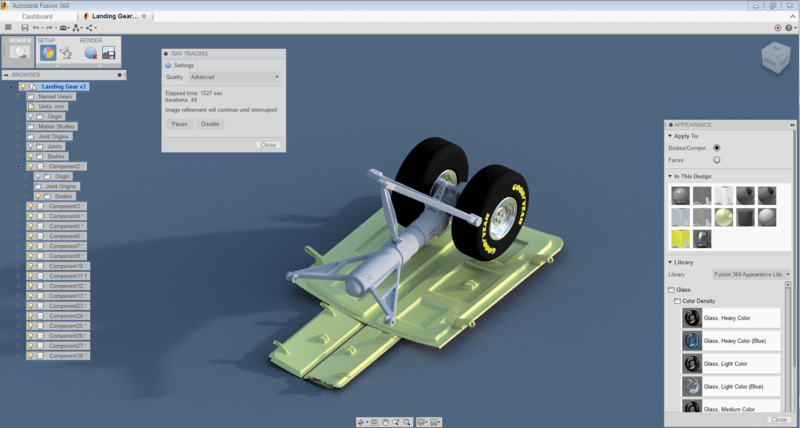 With the CAD companies clamouring to get a cloud CAD system to the market, Autodesk have been pioneering integrated CAD and CAM and now they’ve bundled the offering. When you get a monthly, quarterly or annual subscription of Fusion 360, you also get integrated, CAM 360. What makes Autodesk’s offering unique to the others? 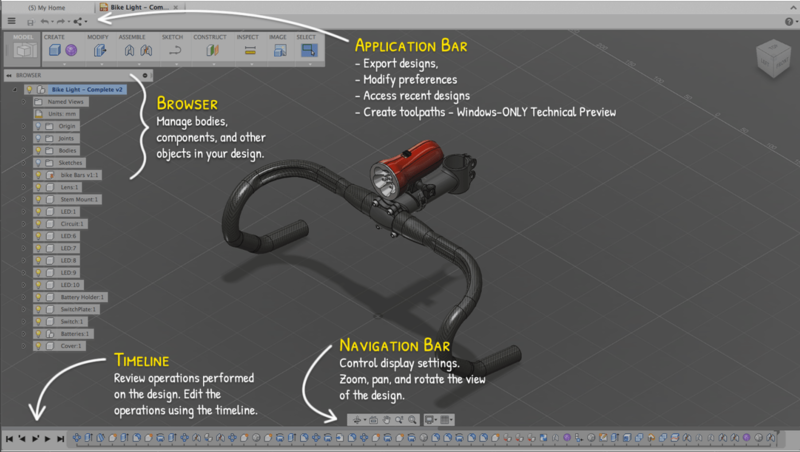 The cloud offers collaboration and real-time updates, a social interface, but the things that make Fusion 360 unique are its CAD technology, Chronicle Recorder, Rendering, Integrated CAM and Pricing Structure. There is a timeline that keeps a sequential record of all your features. You can edit a feature in the same window you created them to change settings, delete or suppress features, etc. like you would in a 3D parametric environment. You can also direct edit with Fusion 360 By push/pull. Having the option of parametrics and direct editing is quite nice giving you flexibility depending on what you want to do. 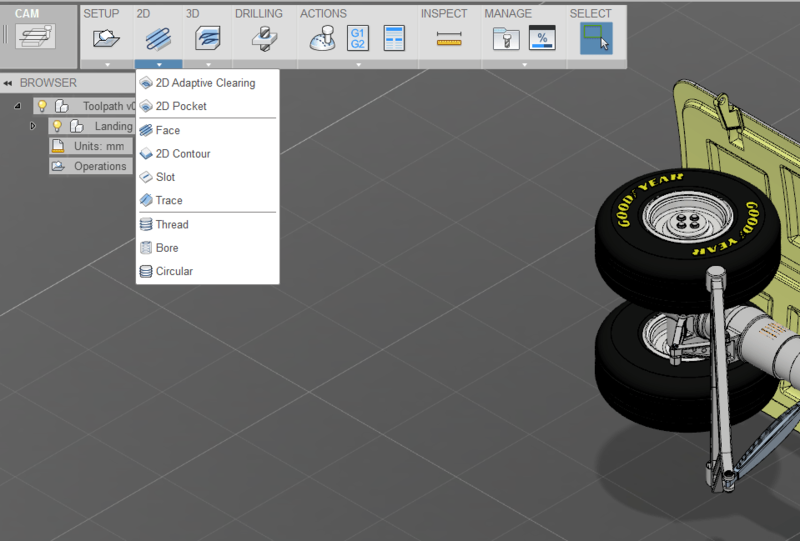 Fusion 360 is still in its infancy yet to reach maturity compared to desktop equivalents, however, one thing that stands out over and above any other Cloud CAD is Fusion 360’s N.U.R.B.S with T-Splines Technology. If you need to design things that are ergonomic, if aesthetics are important, you need to design complex geometry, organic models or maintain G2 continuity but want to do that easily, then NOTHING else on the market comes remotely close, Fusion 360 is a 3D Mechanical CAD system with excellent surfacing capabilities. Surfacing – It has three modelling environments; Model (Solid), Scultp and Surface, so it makes it a versatile 3D CAD tool. Rendering is done using Keyshots Renderer. 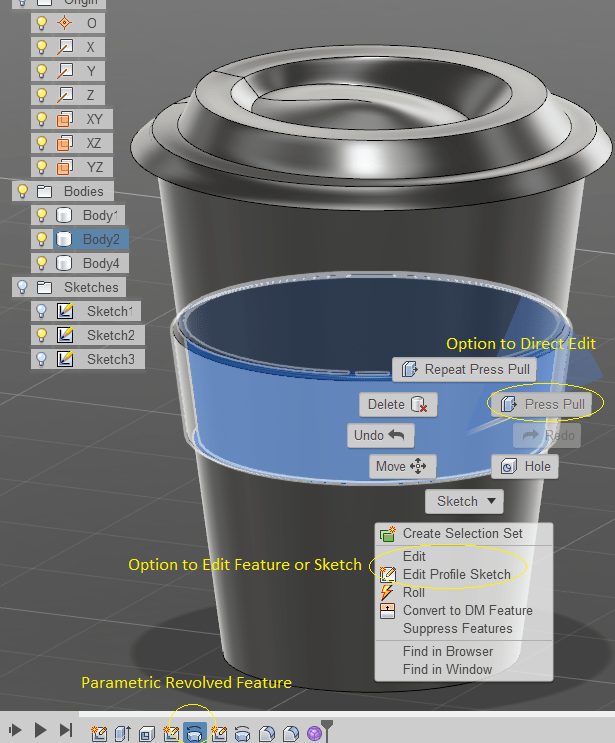 You can click on render while in Fusion 360 in a Standard or Ray Tracing rendering environment, giving real-time visual feedback, you change appearances, materials, environments, lighting, materials, turn on/off part visibility and save images, once rendered by your local machine. When in the Autodesk 360 Hub environment, it pre-defines and renders 4 shots to be used immediately, using the cloud computing which is nice and if you want to render a custom view, it goes in the render queue. It has version control of the rendering, which is another nice feature, so when the model changes, the rendering does but you also have a history of previous renderings. Apart from changing views, there is no control over lighting, background, etc. You can change the aspect ratio and resolution for free. If you want more settings you need to pay for them (1 cloud credit, which is equal to a dollar I think?) and even then, the settings are basic. The rendering isn’t as good as what I’m used to in Autodesk Showcase but for a nice quick render, it’s pretty good. Fusion 360 uses Keyshots rendering engine and with rumours of Showcase 360 hitting the market soon, I’d like to see how it integrates with Fusion 360. Chronicle – With Chronicle you can record video, audio, mouse movements, keyboard strokes and screenshots. Like the HSMXpress offerings CAM for Fusion 360 will have 2.5D CAM for free with Fusion 360 and anything more than that will be an additional subscription. CAM 360 was marketed at around $75 per month with Fusion 360 included, so the additional features of CAM 360 may be around $50 extra? You can subscribe anywhere from a month to a year and with annual pricing at USD$25.00 to USD$300.00 for an annual subscription, the pricing is exceptional. If you add the full features of CAM 360, it may come around the $1000-$1,500 mark per annum, which is what most CAD users pay for annual subscription. Fusion 360 is a separate product from Inventor and the other Autodesk offerings, it’s not there to do a specific function for Inventor, rather be an very affordable cloud based 3D CAD alternative for Industrial Designers and Mechanical CAD users. It doesn’t make sense for Autodesk to make it as good as Inventor or Product Design Suite because Fusion 360 is 10x cheaper, nor would you expect it to be as good at that price. It looks like Autodesk have put in a bit of quality, but mainly quantity with the Fusion 360 offering, with a little bit of everything. With it being a low-end version, it needs more development, lacking some in-depth editing capabilities here and there. Another thing that doesn’t makes sense, is that you can export the file as an Inventor 2014 file, which I thought was great until I opened it in Inventor 2015 as a dumb solid. The rendering is simple compared to Showcase but it does the job. On the positive, Fusion 360 looks like it will add Publisher 360 for technical documentation and Showcase 360 for rendering. It still needs to mature and also, you get what you pay for. Overall, I can’t really point out anything else on the market where you get these features for the price on offer. As one of the autodesk employee who worked on the intregration of rendering in fusion, i need to correct a statement that was made. 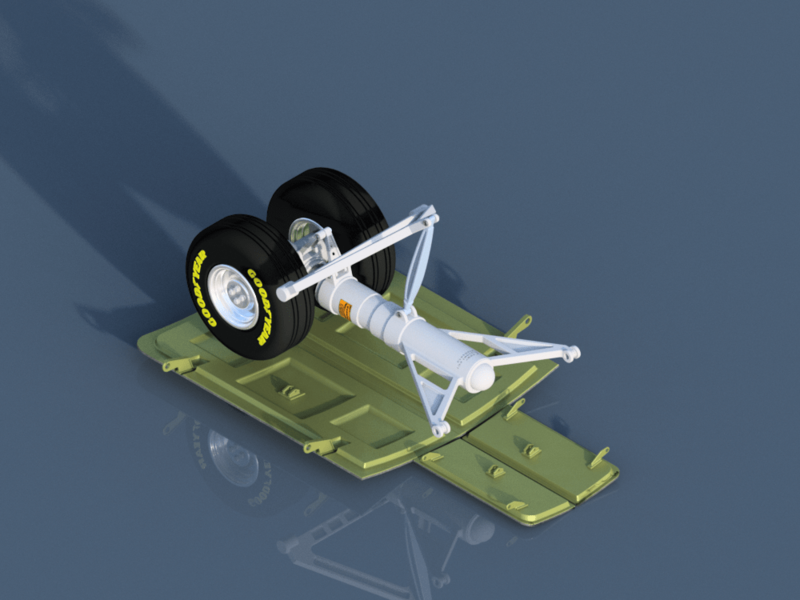 Rendering is done with internal Autodesk technology as opposed to the Keyshot renderer as stated above. My apologies. I read that Fusion 360 used Keyshot and when I used the renderer it looked very similar to Keyshot. You are right, this might be confusing to the “outside world” :). There is a plugin for Fusion 360 to export/link to Keyshot. And now, the new rendering technology embedded inside Fusion , although home brewed at Autodesk uses similar principles than the ones implemented inside Keyshot, and therefore, results look quite similar since the foundation of physically based rendering algorithms are essentially the same.